Whatever you want for your holiday, you will find it in Playa Flamenca – sun, sea and beaches, good food and drink, golfing, children’s activities, local interest, watersports and outdoor activity, leisure and chill out time. 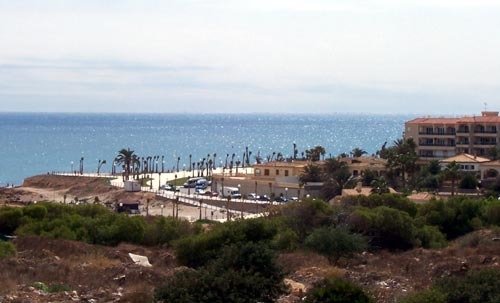 Playa Flamenca is part of Orihuela Costa, the most southerly stretch of the Costa Blanca on the east coast of Spain. The Costa Blanca runs south in the Alicante district from Denia, north of Benidorm, to Pilar de la Horadada on the border with Murcia district. There are loads of interesting places to visit for culture, history, shopping and so on. It is not only beaches and bars. There is so much more to see and do. From here you can travel to Benidorm, Alicante, Orihuela, Cartagena, Murcia and Torrevieja, as well as many other smaller places. Several Blue flag beaches are in walking distance and provide plenty of sun, sea and sangria for your vacation in Spain. The food in Orihuela Costa is very varied and almost any type of cuisine is available in the many bars, cafes and restaurants along the coast. The choice is endless, and not expensive. You don’t even have to take your car to have a wide range of great eating and drinking options to please everyone. Your holiday can be as active or relaxing as you want. There are many famous golf courses within easy reach, and other activities for all ages. In this personal guide I supply information for visitors, and perhaps for residents as well. I address all aspects of your holiday, whatever type of holiday you wish for. And I offer high quality accommodation in my rental apartment in Playa Flamenca. My Visit Playa Flamenca blog will keep you up-to-date as I add new pages and update current ones on Visit-Playa-Flamenca.com. Subscribe via RSS. Welcome to my Visit Playa Flamenca website. A Visitor Guide to Playa Flamenca compiled by an enthusiast for this beautiful and surprising part of the Costa Blanca in Spain. Playa Flamenca apartment for holiday rental. Playa Flamenca apartment to rent for your holiday on the Costa Blanca. Modern, air-conditioned flat. First floor, balcony looks onto pool. Two bedrooms, each with en suite. Fully equipped kitchen. Playa Flamenca shopping. Browse the vast choice of shopping options. Detailed information about Playa Flamenca shopping including supermarkets, commercial centres, street markets and internet cafes. Plus, the small interesting unexpected shops you might miss. Playa Flamenca Beaches. All about the lovely local beaches and beach walks. A personal introduction to the stunning Playa Flamenca beaches and beach walks. Descriptions, routes and photos. Also covers Punta Prima to La Zenia to Cabo Roig. Things to do in and around Playa Flamenca. A selection of things to do in the Playa Flamenca area, Costa Blanca, for children, for sport, for fun. A selection of Playa Flamenca maps to help you locate Playa Flamenca in the Costa Blanca, and in Spain. With detailed annotated street maps. Playa Flamenca Golf courses. There are many good golf courses in the area. Information from a keen golfer about Playa Flamenca Golf courses, including Las Ramblas, La Finca and Campoamor. Travel to Playa Flamenca, Costa Blanca, Spain. Airports, routes and maps. Travel to Playa Flamenca via Alicante or Murcia (San Javier) airport. Travelling by air, driving routes and maps from airport to Playa Flamenca. Guide to the Playa Flamenca commercial centres. Details of the businesses in Flamenca Beach CC, La Mosca CC, Citrus CC and the beach area. Also La Campana CC and Punta Prima. Contribution about the local nature reserve; Parque Natural de las Lagunas de la Mata y Torrevieja; from a keen bird watcher. Also Parque Regional de Las Salinas y Arenales. Local walks in Playa Flamenca, Costa Blanca. A variety of Playa Flamenca walks to suit all tastes; beaches and inland. Food and Drink in Playa Flamenca. Food and Drink in Playa Flamenca. Loads of information about eating and drinking in the many cafes and restaurants in and around Playa Flamenca, Costa Blanca, Spain.